We have an area between the east paddock and the house that doesn't get very much attention. About this time of year it is overrun with kudzu, sapling oaks, poison ivy, and ligustrum, and it just seems like we ought to do something about it. What do we do? Set up the electric netting and turn in the goats. They're always cautious at first. It's as if they don't remember having been here before. Eventually they eat their way down the length of the area. The ducks in the pool get a close look. bad. The goats love it and its a good source of B vitamins, calcium, & iron. it's a bit of a bother to set up, plus it sags. ends at the fence with the charger/battery is set out in the sun in the field. Actually, I haven't featured my girls in a post for awhile, so here they are. For anyone just passing through, they are Kinders. And my little girls who are getting so big that I can't always tell them apart from the adults from a distance. Well, except April here who is my only all-black doe. April will be six months old on October 1st. Daisy will be 5 months old on October 5. Kinders are considered aseasonal breeders, meaning they can breed any time of the year. However, their strongest heats are in the fall, so that's when most Kinder owners breed for spring kids. This fall I plan to breed my three adult does and wait until next year to breed the younger girls. I want to start alternating my breedings so I can have milk year around. Even if setting up the LX fence is a pain, it definitely looks like a worthswhile thing to do. The girls get some nutritious variety, and you get 'free' weeding and ground clearance. That well fed look is part of the Kinder breed character. They are a dual purpose breed so they should have a strong meat character as well as strong dairy for plentiful rich milk. 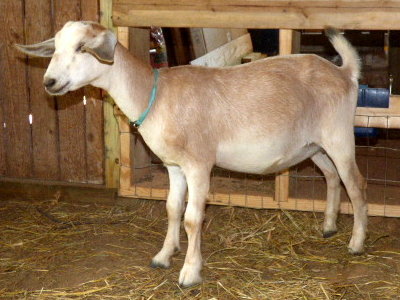 Most dairy goats are much slimmer looking, which is part of being dairy! I've had several Kinders which looked more like sized-down dairy goats. It's not the look I go for, however. Your goats are beautiful! The weed control they do is awesome, does it change the flavor of the milk? Agreed! I confess Jessie is a personal favorite because she has a sweet personality and keeps her weight well while in milk. That being said, I think Violet and Daisy show the best Kinder qualities in my herd. When they're young though, it's hard to tell. They change a lot physically when they grow up. 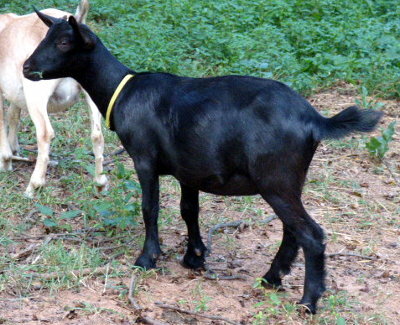 I use electric fence (poultry net, actually) for my goats. Anywhere it changes direction, I either pound a t-post or use a tree, and use baling twine to guy off the fence to help keep it taut. I love the fencing. My only draw-back here is the inability to get a good ground - too many rocks to pound the ground rods in very far. I'm going to try laying them horizontally in a 6" trench - it's been suggested that that will work much better. I'll still have to water them in the summer, but it will keep the sucker hot!! I had to research Kudzu as I have never heard of it before. What an interesting history it has. Your goats look good, lovely coats. Those goats are looking healthy, you should loan them out for weed removal! Laura, we do the same with our netting. There is a type of energizer for dry ground, but I can't remember what it's called. I remember reading about it before we bought ours. The horizontal ground rod sounds much, much easier to install than vertical! Leigh you would be at home in my barn. While the standard for dairy goats is very concerned with "dairy character" is very precise I have done well with what I call "substantial" girls. Both in the show ring (back in the day) and in the bucket. I think it happened that way because I got into dairy goats for home dairy purpose and the show ring was always secondary but fun. My long time vet and friend Dr. D had no problem mincing words about what sometimes hedged on my over conditioned does. Never fat just sometimes a bit well fed. Yes I know not desirable but we managed to walk that fine line. I think the most important thing for one to realize is good confirmation is important to more then a good placing in the show ring. It is imperative to a dairy animal doing it's purpose properly and also for longevity. So we are in agreement about the folks who take the "dairy character" a step to far. But I also roll my eyes when someone calls saying they want a dairy goat that isn't a show goat. Then we have the talk about how good confirmation is the difference between having a good solid doe that has longevity in both years and production and one that breaks down in the hocks and has the udder dragging early on in her life. Love how your girls get all the goodness surrounding them. You bring up very important points. I confess that I knew very little about conformation when I got into goats. Of course I wasn't interested in showing, so good conformation only gradually came into my awareness. The leadership in the Kinder Goat Breeder Association stresses it and proper conditioning, so I'm learning. One of the things that appealed to me about Kinders was the stated quality of good conversion of feed to muscle (inherited from their Pygmy genetics). 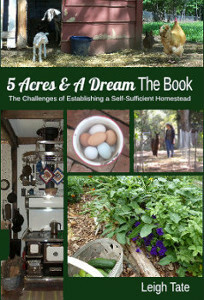 With a personal lifestyle goal of self-reliance, that appeals to me tremendously. In spite of that I've had three Kinder does that remained seriously under-conditioned when in milk (for non-goat folks, that's goat talk for "skinny"). That's been discouraging for me. Lini, the black and white one, is such a doe. She eats two to three times what I feed the others and is still too bony for my liking (and for a Kinder). Jessie does well but she's a fussy eater. Violet has a good layer of padding (but not too much) and I'm happy with that. She'll freshen for the first time this coming spring and then we'll seeh how well she does in milk. I kept the doelings with the best skeletal width and shortest legs (Kinders are supposed to have the shorter Pygmy-like legs). If they can maintain good weight they and their kids will be keepers. It's been a tough summer though, because it's been so hot and dry. My pastures are in terrible shape, with all my good grazing forage dried up and gone. So I'm feeding more concentrates than I'd like to, but goat health comes first, goals have to fall in line with that. Well, it's not just maintaining good weight that's important. I'm working on that and udder improvement! That was another criteria for "keepers." As I learn the finer points of Kinder conformation, those come into the decision making as well. One problem is that there are so few Kinders in the Southeast that it's difficult to find that perfect buck who will help improve your herd. Mostly I find I'll just have to work with what I've got, select the best according the the breed description, and keep working from there. Yesterday I saw a herd of goats grazing along the road. I passed them twice...never saw any humans. I was worried that they had escaped. The good thing was that no one seemed interested in crossing the road. They should teach the deer! Leigh, I wanted to ask about your mozzarella recipe - how many pulls does it take before your cheese is smooth and shiny? Mine stretched but was somewhat grainy all the way through, until I just made balls and put them in the brine. This is the closest to success I've come, after many fails with other recipes, so I'm hopeful I can perfect my technique with your recipe! Interesting! I wonder if they were on brush control or escapees. Goats aren't inclined to wander out of familiar territory, so you'd have to wonder if they hadn't done it before. Kate, I have to confess that I don't always get a smooth, shiny cheese, but it's rare with this recipe. It's important that the water is between 145 and 150°F, which is hot enough to soften the curds for pulling. If they become hard to pull or grainy, I put the curd back into the hot water until it heats up and softens again. Usually I pull several minutes, or until the strings are smooth. I hope that helps! Keep me posted on your progress; I think you'll get it even if it takes a few tries. I like goats very much. I never had any luck getting them to cooperate and eat down the meadow so I wouldn't have to mow it, but they are good animals to have around. If you can keep them from eating everything they aren't supposed to, that is. Looks like your fence does a good job. I choose dairy goats because they were pretty much the only game in town 31 years ago. And I fell madly in love with Nubian's. In the day before Boer goats Nubian's did very well at being dual purpose for milk and meat. I would be most interested in learning about your breeding program. I do a good deal of line breeding as it works well and was advised by a respected dairy goat breeder/judge that when the trait you desire is offered in your herd don't be shy about using related animals to cement the desired trait by breeding. That advice has done well for me over the years. Harry, you're describing goats in a nutshell! I hear sheep make better lawnmowers than goats, but we don't have enough land to give them a try. The fence works well, except the ground has to be pretty well cleared of sticks, branches, and brush, anything that might interfere with the current. That being said, it only takes a shock on the nose once, and the goats respect the fence. We also have found that Nubians are good at providing meat as well as milk. Can't say I was terribly thrilled with their personalities though, LOL. My breeding program is still in the formation stages. 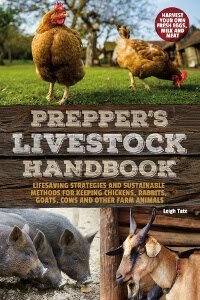 My goal is to produce a true homestead-quality Kinder, one that is truly dual purpose with a good balance of both meat and dairy character. 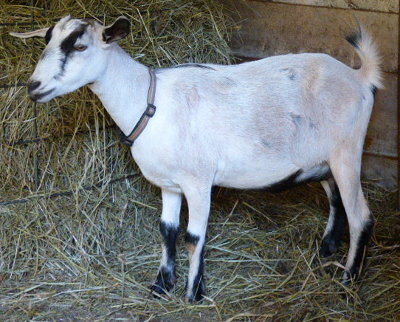 By homestead quality, I mean a goat that doesn't need a lot of feed to maintain condition, but one that maintains condition well on pasture, forage, hay, and what the average homesteader can grow. The problem has been finding foundational breeding stock that meets these qualifications. When I first got interested in Kinders, there was nobody remotely near me that bred them. My first Kinders were simply what I could find, flaws and all. I found my first two registered does on Craigslist, and I've had three does and two bucks imported from other parts of the country. I choose them by pedigree and photos of parents and grandparents, but you never know how they'll grow up. Too often my Kinders have been strong in dairy, but not in meat character. So I've been learning about Kinder conformation, and keeping the goats which come closest to ideal. I definitely agree about careful line breeding, which I think requires good quality bucks. My first buck was narrow with long legs, which he passed on to most of his kids. I kept two kids most promising kids from my 2nd buck, and am waiting to see how they turn out. I have two bucklings which are my current hopefuls, but both are young yet. I'll just have to wait and see how they turn out and what kind of kids they produce. In the meantime I'll continue to keep goats closest to the Kinder standard, while hoping and praying for the best. Kelsee, yes, I'm really happy with Violet. She widened out a bit this summer and gained a little weight. The width is bone and muscle, not fat! It amazes me when the kids pull out genetics that you don't see in their parents. Violet had her first date with a buck several weeks ago. Now waiting to see if she goes into heat again! Nicely done my dear! And you nailed it goats and prayer lol.